St. John's also takes sole possession of third place in the Big East after they and Butler entered the day in a five-way tie, along with Seton Hall, Georgetown, and DePaul. DePaul lost home to Marquette, 92-73, to fall to 5-7, along with Butler, and Georgetown is at Seton Hall Wednesday night in Newark, so whoever wins will join St. John's in third place at 6-6. One big difference for St. John's on Tuesday night was the return of Mustapha Heron after a one-game absence, and he scored 28 points on 8-15 from the field, including 2-4 on three-pointer, with 4 rebounds and 2 assists. Forward Marvin Clark also stepped up, scoring 18 points on 7-16 shooting (4-10 three-pointers), with 2 rebounds and an assist. This was Clark's best performance in a while, after he was held to six points against Providence on Saturday, and was scoreless at Marquette last Tuesday. St. John's came out with a lot of energy in this one, fired up to be at The Lou for the first time in a month, as they raced out to a 17-5 lead capped by a Justin Simon layup six minutes in. Butler pulled within five later on in the first half, but St. John's took an eight-point lead, 38-30, into halftime. St. John's went back up six points, 61-56, on a Heron free throw with 5:42 remaining, but Butler once again came back, and eventually took a 66-65 lead on a Jorgensen layup with 17 seconds remaining. On St. John's ensuing possession, Christian David stole it from Heron, and instead of taking a timeout, he got it to Jorgenson, who missed a jumper. 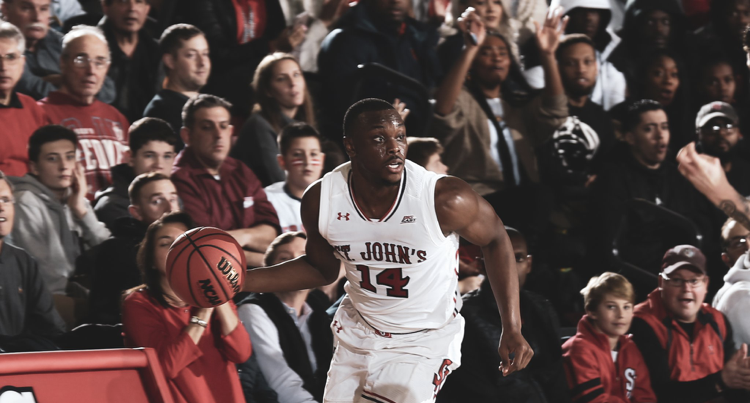 St. John's is back in action on Sunday at 5 p.m. at Madison Square Garden against the current Big East leader and defending national champions, Villanova.